A government minister has played down cabinet divisions about whether the cap on public sector pay should be lifted. But he said ministers all wanted to provide as many resources as possible for public services and that this would be addressed in the next Budget. One union has described the 1% cap as “dead in the water” after receiving an offer of a 2% increase for its workers. Nonetheless, the Fire Brigades Union (FBU) said the offer was “simply not good enough”. “It does not recognise the extra work firefighters have been doing, it fails to address their falling living standards and, despite hints at improvements, does not make clear what they will be earning in future years,” said FBU general secretary Matt Wrack. Speaking on BBC Radio 4’s Today programme, Mr Grayling rejected the suggestion the offer to firefighters had “busted” the 1% cap, saying they were the responsibility of local authorities rather than central government. The wages of public servants the government is responsible for “will be a matter that’s addressed in future Budgets”, he said. Several ministers have suggested they want the cap, in place since 2013 following a two-year pay freeze, to be lifted, and some Conservative MPs have called for a change of direction after the Tories lost their majority in the general election. But Downing Street has insisted the policy has not changed, with Chancellor Philip Hammond urging ministers to “hold their nerve”. Meanwhile the FDA union, which represents senior civil servants, has written to Foreign Secretary Boris Johnson along with other cabinet ministers who have indicated they support easing pay restraint, calling on them to follow up their “warm words” with action. 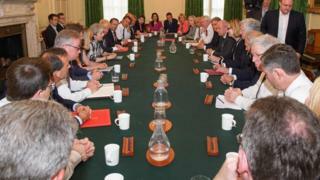 “Each of these ministers will have sign off on the pay settlement for their staff this year. They cannot hide behind pay review bodies with restricted remits. Failure to act will demonstrate these warm words were little more than meaningless platitudes,” said general secretary Dave Penman. The Institute for Fiscal Studies has said increasing pay in line with inflation next year – rather than 1% – could cost about £5bn. Speaking at a conference in South Korea on Tuesday, former prime minister David Cameron said people calling for an end to austerity were “selfish”. “The opponents of so-called austerity couch their arguments in a way that make them sound generous and compassionate,” he said. “They seek to paint the supporters of sound finances as selfish, or uncaring. The exact reverse is true.